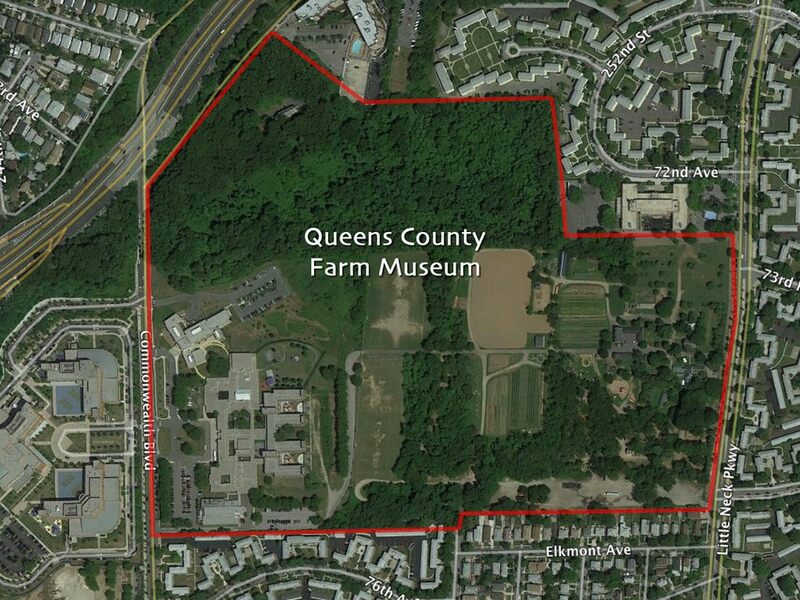 My friend Christina is looking for volunteers to help with a wildlife survey in Queens. Queens County Farm Museum had their annual meeting tonight (I am on their board) and one of their goals for the upcoming year was to have a bird survey of the property done I’m sure they would also appreciate a survey of everything else found on the property (butterflies, dragonflies, mammals, etc.). The Queens County Farm Museum dates back to 1697; it occupies New York City's largest remaining tract of undisturbed farmland, and is the only working historical farm in the city. The farm encompasses a 47-acre parcel that is the longest continuously farmed site in New York State. 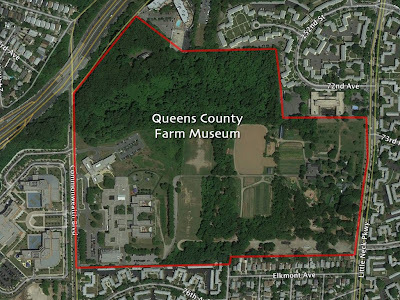 The site includes historic farm buildings, a greenhouse complex, livestock, farm vehicles and implements, planting fields, an orchard, and an herb garden. Back in June of 2008 I posted about an American Robin in Prospect Park with a pigment problem called "leucism". Despite his differences, this bird appears to be quite the survivor. Leucism (occasionally spelled leukism) is a general term for the phenotype resulting from defects in pigment cell differentiation and/or migration from the neural crest to skin, hair, or feathers during development. This results in either the entire surface (if all pigment cells fail to develop) or patches of body surface (if only a subset are defective) having a lack of cells capable of making pigment. Most robins die their first year. But the lifespan goes up dramatically for the ones that survive that critical time, because they've learned so many important life skills. 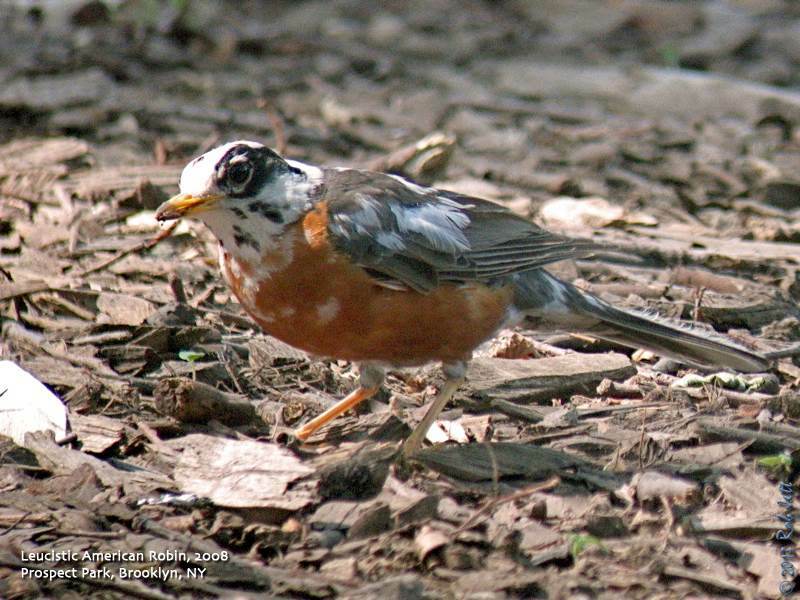 Of those that survive their first year, most wild robins live to be about 5 or 6. 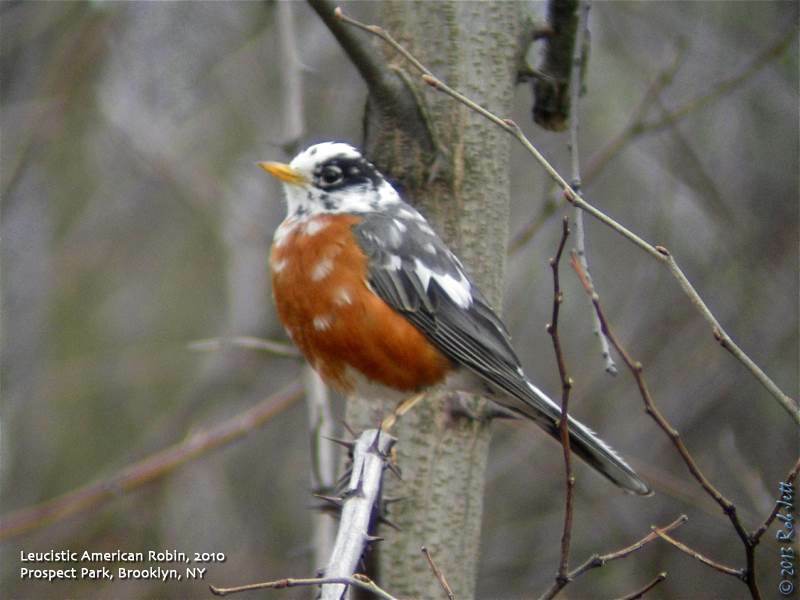 As of February, 2001, the longest-living banded wild robin ever recorded had survived 13 years and 11 months, according to the Bird Banding Laboratory at the Patuxent Wildlife Research Center. In captivity, robins have survived longer than 17 years. Sunday morning, January 13th, began with dense fog shrouding coastal New York City. I had made plans to meet Heydi early to bird Floyd Bennett Field and Dead Horse Bay. One might think that looking for birds in the fog would be an exercise in futility, however, it is this type of weather event that sometimes leads disoriented birds to unexpected places. As I rode the bus down Flatbush Avenue I was excited at the prospect of finding, not just something new for the year, but something unusual. We had tried twice, unsuccessfully, over the past couple of weeks to locate a reported Canvasback along the piers at Brooklyn Bridge Park. These large ducks are abundant throughout the country, just not in Brooklyn. The ever-growing Winter flock of scaup at Dead Horse Bay, we reasoned, might be a good place to spot one. I also wanted to find a flock of Horned Larks and, perhaps, a Lapland Longspur hiding amongst their ranks. Floyd Bennett Field is, for the most part, still off limits to the general public due to the ongoing FEMA and other emergency personnel presence post-Sandy. Horned Larks can usually be found feeding on the Cricket Field in the Winter. At least we'd be able to scan the field through the perimeter fence without having to access the park. Our first stop after getting off the Q35 bus was the Cricket Field. The field was devoid of birds...not a good start to the day. We birded around the field edges then walked the 3/4 mile stretch along Flatbush Avenue to the trailhead for Dead Horse Bay. Along the way we crossed paths with a small feeding flock of passerines which included four Field Sparrows. Field Sparrows are grassland breeding birds that are normally only found around Brooklyn during migration, but over the past few years these lovely little sparrows seem to have become year round residents at Floyd Bennett Field. By this point the fog had begun to lift a little, making scanning the water for other birds a bit easier. I wanted to try and digiscope a photo of the Canvasback and asked Heydi where it had drifted to in the flock as I had lost it again. She used a picket fence at the marina in the distance as a reference. I focused my scope then asked, "Where in relation to the Thick-billed Murre?" Huh?! I wasn't joking. I was looking at one of these monochrome pelagic birds slowly paddling around at the far perimeter of the scaup flock. It was unbelievable for a couple of reasons. First, these birds are normally found far out in the ocean. Second was, this was actually the second time a couple of years that I spotted a Thick-billed Murre in Brooklyn! I posted about the previous one here. 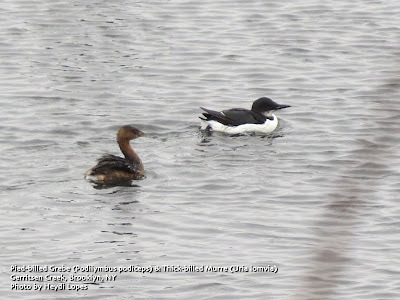 Rob Jett just called to report that he and Heydi Lopes have just found a Thick-billed Murre in Dead Horse Bay. It is behind the usual massive flock of Greater Scaup (which includes at least one Canvasback that they just found). If coming by car, you must park at Aviator Sports Parking Lot (across Flatbush Avenue, in Floyd Bennett Field), and walk south. I suppose that alternatively you could park in the Brooklyn Golf Driving Range, but it is not much closer and is technically private (I think). Plugging these coordinates into Google Maps will yield a green arrow marking the locations. While waiting for other birders to arrive, we decided to walk around to the south side of the small peninsula to the scan the water near Dead Horse Point. Each time we thought that the fog was lifting another wave of grey would come rolling in. Finding birds far from shore was, at times, futile. However, a Razorbill feeding in the water a few yards from shore made up for any disappointment. There were at least a couple more of these alcids feeding a little farther out in the bay. I laughed at Heydi's frustration trying to photograph this unusual bird as it kept unexpectedly submerging then popping to the surface in exactly the "wrong" spot. I called Rob, who was the first birder to arrive. He couldn't find the murre, so Heydi and I walked back down the beach to help relocate it. By the time we got there he had the bird in his scope. Keir arrived a few minutes later. At this point the murre was swimming around closer to the marina and at the back of the scaup flock. I received a call from Jean Loscalzo, who was on her way to Sheepshead Bay with a few Queens County Bird Club members to bird the bay from a boat. The murre was disappearing into the fog towards Plum Beach, to the West. I eventually re-found the bird sitting in the water beneath the bridge at the entrance to Gerritsen Creek and gave that information to the birders on the boat. Heydi, Keir, Rob and I decided to head back to Floyd Bennett Field to regroup and get some food at Aviator Sports. As we ate, tweets, email alerts and phone calls kept coming in with up-to-the-minute details on the Thick-billed Murre's whereabouts. The bird had made his way all the way up Gerritsen Creek to Avenue U and was swimming around in front of the Marine Park Salt Marsh Nature Center. After lunch we headed over to Marine Park. The PBS series "Nature" begins a new three part series on the 50 year career of David Attenborough. "Attenborough’s Life Stories" premieres Wednesday, January 23-February 6 at 8/7c on PBS (check local listings). 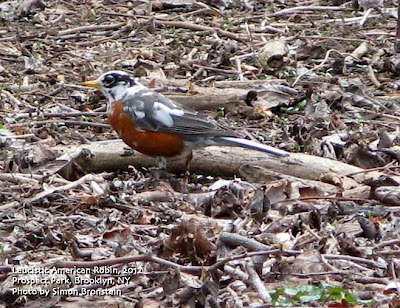 Sunday, February 3, 2013, 10 a.m.
Free See the birds that call the Park home all winter. Start your Sunday morning surrounded by nature! Greetings. This is the New York Rare Bird Alert for Friday, January 25th, 2013, at 11:30pm. The highlights of this tape are GREATER WHITE-FRONTED GOOSE, BARNACLE GOOSE, CACKLING GOOSE, EURASIAN WIGEON, TUFTED DUCK, KING EIDER, BARROW'S GOLDENEYE, BLACK-HEADED GULL, GLAUCOUS GULL, DOVEKIE, RAZORBILL, SNOWY OWL, NORTHERN SHRIKE, Winter Warblers, CLAY-COLORED SPARROW, and Winter Finches. Three GREATER WHITE-FRONTED GEESE were reported last week: one at South Haven County Park on Saturday, another Saturday on Westbrook Pond at North Great River, and a third at St. Charles Cemetery in Farmingdale on Sunday. Two BARNACLE GEESE were seen last week: one at St. Charles Cemetery in Farmingdale on Saturday through Tuesday, and another at Belmont Lake State Park in Babylon on Thursday. The previously reported CACKLING GOOSE was still at Van Cortlandt Park in the Bronx on Saturday. Six EURASIAN WIGEONS were seen on the pond at the Sayville Golf Course on Sunday, and another EURASIAN WIGEON reappeared Sunday on the pond at Saint John's Church in Cold Spring Harbor, along with the previously reported TUFTED DUCK. The TUFTED DUCK has not been reported since Sunday, and the pond may be frozen over. Reports from Montauk on Monday included a first winter male KING EIDER with ~25 Common Eider and 20 RAZORBILLS at the Point, with two of the RAZORBILLS feeding fairly close to shore, and the continuing pair of BARROW'S GOLDENEYE on Lake Montauk, this time at the north end of the Lake. Two DOVEKIES were reported at Montauk Point on Sunday. 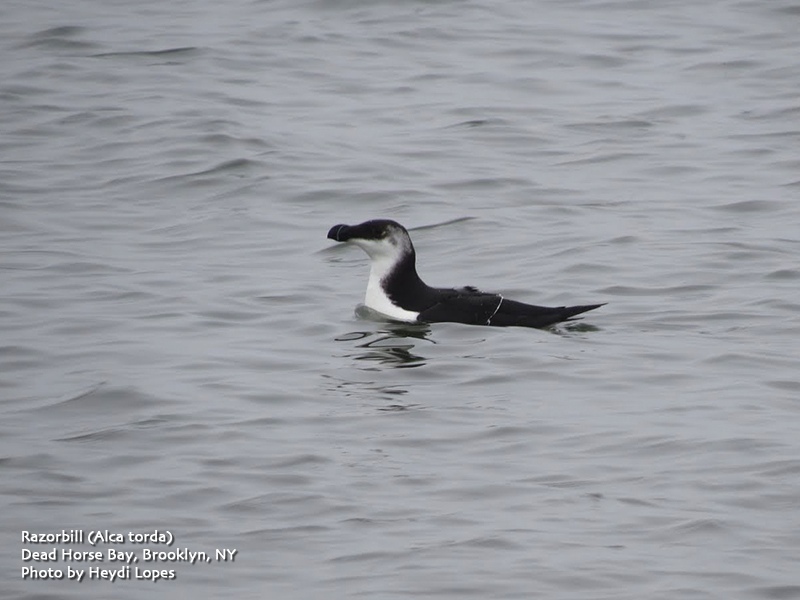 A RAZORBILL was seen from Fort Wadsworth, Staten Island, on Saturday, and another was at the Ponquogue Bridge in Shinnecock on Sunday. A BLACK-HEADED GULL was found Saturday at Lake Montauk. A GLAUCOUS GULL was seen Monday near the Jessup Lane Bridge to Dune Road in Westhampton. A SNOWY OWL appeared sporadically on Monday and Wednesday at Hicks Island in Napeague, where the resident LESSER BLACK-BACKED GULL remains. 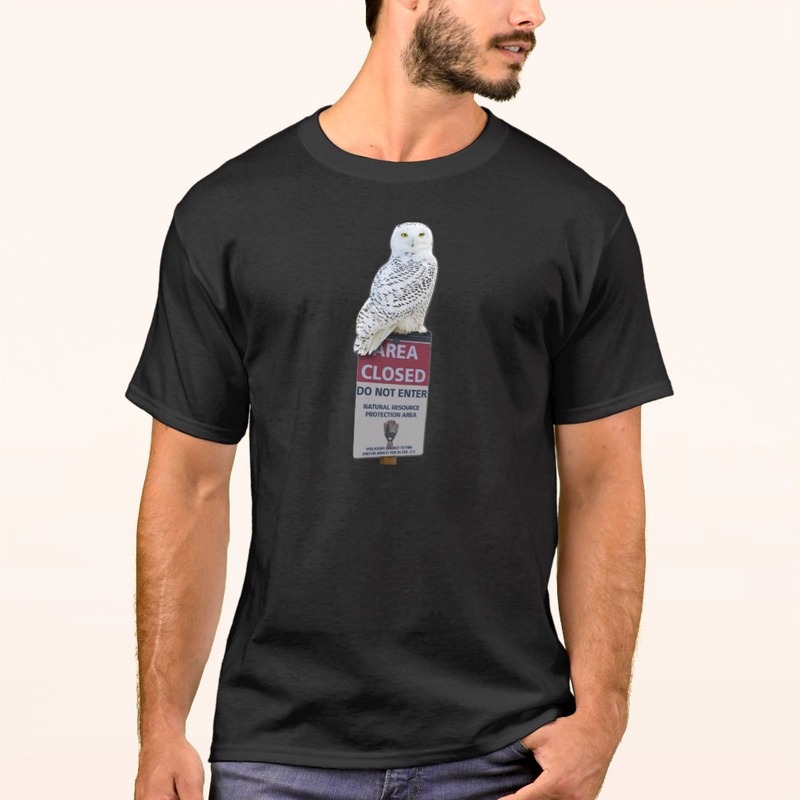 Another SNOWY OWL was seen on Sunday and during the week at Jones Beach. An immature NORTHERN SHRIKE was seen by many birders last Sunday at Ward Pound Ridge in Westchester County, but has not been reported since then. Five uncommon species of warblers reported through the week were as follows: PRAIRIE WARBLER and "Western" PALM WARBLER in Pelham Bay Park on Saturday; a NORTHERN WATERTHRUSH and WILSON'S WARBLER at the junction of the Long Island Expressway and Alley Pond Restoration Area in Queens last Friday; and a YELLOW-BREASTED CHAT in Prospect Park on Sunday. Two previously reported CLAY-COLORED SPARROWS were seen again this week: one at Marshlands Conservancy in Rye last Saturday; the other at Heckscher State Park, west of the pool area, on Monday. Time and space for winter finch reports preclude us listing all of the winter finches, but be advised that RED CROSSBILLS, WHITE-WINGED CROSSBILLS, and COMMON REDPOLLS were seen throughout the area through the week. Other interesting birds reported this past week were: a RED-NECKED GREBE near the bridge to Smith Point County Park and another near the Jessup Lane Bridge to Dune Road in Westhampton, both on Monday; two COMMON RAVENS continuing in the water tower area in Hampton Bays, and a flock of ~12 AMERICAN PIPITS seen near the bison farm on Roanoke Avenue and Reeves Road in Riverhead on Wednesday and Thursday. Endangered spoon-billed sandpipers arriving at their wintering grounds in China are being threatened by nets designed to trap shorebirds. The spoon-billed sandpiper is one of the world's rarest birds. Recent sightings of the bird at several new sites along the coast of southern China indicate the species is more widespread than thought. But the study also found evidence of large-scale shorebird trapping using "mist nets" in some of these key areas. Last month four spoon-billed sandpipers were sighted at new wintering grounds in Fucheng, south-west Guangdong Province: the latest evidence that the bird is migrating to more widespread areas in China than previously known. Members of the Hong Kong Bird Watching Society discovered a group of the critically endangered birds in partially drained fishponds in Fucheng. During winter, spoon-billed sandpipers (Eurynorhynchus pygmeus) migrate from their breeding grounds in northeastern Russia and travel to South, South East and East Asia. The sparrow-sized wading bird is the only species to be born with its distinctive spoon-shaped bill, which it uses to peck and probe in mud to find food. The latest sightings, along with reports of the bird at several other sites in southern China in recent years, "[indicate] that this is a more important wintering area for the species than was previously known", according to BirdLife International. However, the study, carried out by several conservation organisations, also reported that the practice of shore-bird trapping in some of these important wintering sites for spoon-billed sandpipers and other migratory birds has worsened in recent years. According to BirdLife International: "Illegal bird-netting now poses a major threat to spoon-billed sandpipers and other shorebirds." In 2003 the team discovered a spoon-billed sandpiper caught in a bird trapper's net in Zhanjiang. And during their recent survey the team of conservationists recorded a total of 460 mist nets in use beside shorebird roost-sites on fishponds, paddyfields, marshes and sandbars on the coast. According to the Wildfowl and Wetlands Trust (WWT), the species has declined by 90% in the past 10 years and there may be less than 100 breeding pairs left in the wild. Hunting and habitat destruction in their wintering grounds are known major threats to the bird. BirdLife International says this evidence of extensive shorebird trapping has been reported to the Guangdong Forestry Department. According to the organisation: "Discussions are under way amongst Chinese birdwatchers and conservationists about how to support the local government agencies to address the trapping of spoon-billed sandpiper and other migratory birds... at the key sites for these birds." The team of conservationists aim to locate more wintering spoon-billed sandpipers in Fujian, Guangxi and Hainan in southern China. In 2011 organisations in the UK started a captive breeding programme to help boost the birds' numbers at the WWT reserve in Slimbridge, Gloucestershire. Focus: The "chase" is at the behest of the leader deciding on location(s) based upon that week's Rare Bird Alerts and Listserve reports of high quality birds, rare geese species among potential pursuits. Leader: Rob Jett a.k.a. 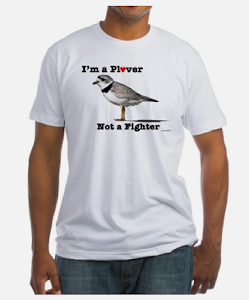 "The City Birder"
Registration opens Monday 1/14. Ride: $15. 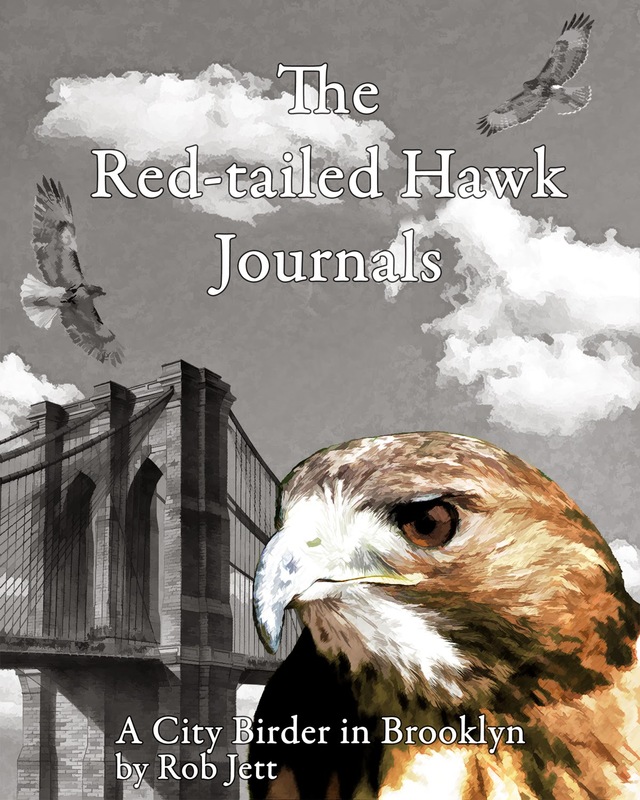 Guide: Gabriel Willow Winter brings many rare birds to NYC that can’t be found here at any other time. Perhaps most exciting are the “snow birds” of the Arctic tundra that can occasionally be found in tundra-like habitats further south, such as snow buntings and snowy owls. We will travel to Floyd Bennett Field in search of these and other winter visitors (such as horned lark, tree sparrow, and rough-legged hawk). 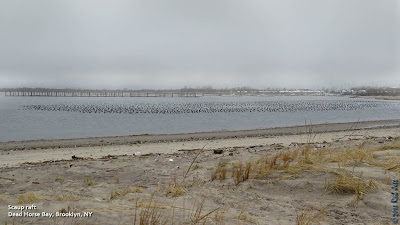 We will then head to Fort Tilden and Breezy Point to look for wintering ducks, grebes, loons, and other seabirds. **Note: the destination of this trip may vary depending on the unpredictable whereabouts of winter visitors; we will generally go where the birds are! Floyd Bennett Field may also be closed due to its use as a post-hurricane Sandy center of operations. As of the publication date, most Staten Island parks were still closed because of storm damage. If you see an asterisk next to a date, you should contact the walk leader to confirm if the walks are on. *Saturday, January 26, 9:15 a.m. to 4:00 p.m.
Come join others who enjoy a cold day outdoors. Ten moderate miles at a comfortable pace. We are starting out at Willowbrook Park. Meet at Willowbrook Park at the Victory Boulevard entrance parking lot near the ballfields. Bring lunch and beverage and sturdy walking shoes. Dress warmly in layers. We go in all weather but walk is shortened if high pollution levels occur. Come see what the winter woodland has to offer: winter birds, bare forest trees, frozen ponds, evergreens and possibly some snow cover to detect deer visits, and always beautiful vistas. For more information call Dominic Durso at 917-478-7607, Charles Perry at 718-667-1393 or Don Recklies at 718-768-9036. Saturday, January 26, 12 noon to 2:00 p.m. Walk the interpretive trails through the grasslands and wetlands to look for evidence of deer and other winter wildlife, search for silk moth cocoons and identify winter birds. There is much to be seen among the rolling grasses and busy ponds, even in the heart of winter. Meet in the parking lot along Hylan Boulevard across from the CYO Center. Sunday, January 27, 10:30 a.m. to 12:30 p.m.
Join naturalist Mike Shanley as we explore Great Kills Park in search of wintering species of birds. We will be focusing on ducks and other sea birds as we tour the redesigned shoreline. The surge created by Sandy breached the dunes and poured over the spit of sand connecting Crooke’s Point with the mainland. Witness the work National Park Service has done to reengineer the beach and dunes. Please meet by the feeders at the Environmental Field Station. Bring binoculars and dress accordingly. Greetings. This is the New York Rare Bird Alert for Saturday, January 19th 2013 at 1AM. The highlights of today's tape are BARNACLE GOOSE, CACKLING GOOSE, EURASIAN WIGEON, Eurasian form of GREEN-WINGED TEAL, TUFTED DUCK, KING EIDER, HARLEQUIN DUCK, BARROW'S GOLDENEYE, WESTERN GREBE, NORTHERN FULMAR, RED-SHOULDERED HAWK, DOVEKIE, THICK-BILLED MURRE, RAZORBILL, ATLANTIC PUFFIN and SNOWY OWL. The previously reported BARNACLE GOOSE was seen through Tuesday at St. Charles Cemetery in Farmingdale. A CACKLING GOOSE was found at Eastport Pond at Eastport Long Island on Sunday and another bird lingered through the week at the Parade Ground at Van Cortlandt Park where 14 RUSTY BLACKBIRDS and 2 EASTERN BLUEBIRDS were also present through Tuesday. Two Eurasian form of GREEN-WINGED TEAL were found Sunday at Smith Pond in Rockville Centre. The TUFTED DUCK continues to be seen at Saint John's Pond at Cold Spring Harbor where a EURASIAN WIGEON was found in the harbor on Tuesday. Three HARLEQUIN DUCKS and a female KING EIDER were noted Monday at the jetty area at Point Lookout. A BARROW'S GOLDENEYE was still present through Monday at the West Pond Jamaica Bay and another bird was at Montauk Lake also on Sunday. On Sunday a WESTERN GREBE was discovered west of the Ponquogue Bridge at Shinnecock and was again found on Tuesday. A RED-SHOULDERED HAWK was found today at the Massapequa Preserve. On Sunday 42 ATLANTIC PUFFINS, 437 DOVEKIE, 5 NORTHERN FULMAR and 5 BLACK-LEGGED KITTIWAKES were found on a pelagic trip off the South Fork of Long Island on reaching the Shinnecock area 2 RAZORBILLS and 2 RED-NECKED GREBES were also seen close to shore. A THICK-BILLED MURRE was present through the week at Dead Horse Bay in Brooklyn. A RAZORBILL was reported Wednesday from Playland in Rye. On Thursday a SNOWY OWL was seen at the West Pond area at Jamaica Bay. Other interesting birds reported last week were: 2 AMERICAN BITTERNS throughout the week west of Quogue on Dune Road, 2 BALD EAGLES reported, 1 subadult at Cold Spring Harbor on Tuesday and another subadult from Plumb Beach in Brooklyn on Friday where an unusual Western WILLET was noted. A WILSON'S SNIPE was seen south of the highway at Eastport Pond on Sunday. An ICELAND GULL was reported Monday at Point Lookout. Two COMMON RAVENS continue to inhabit the water tank area in Hampton Bays. Crossbill sightings for the week are as follows: 20 REDS on Dune Road in Jessup Lane on Tuesday, 2 WHITE-WINGEDS and 20 REDS at the New York Botanical Garden in the Bronx on Sunday, 47 WHITE-WINGEDS and 3 REDS at Cupsogue also on Sunday and 20 REDS at Cupsogue on Friday. Tom Burke will be away next week please call in reports to Tony Lauro at (631) 734-4126. In a recently published report, the National Oceanic and Atmospheric Administration showed that 2012 was this country's warmest year to date. 2012 marked the warmest year on record for the contiguous United States with the year consisting of a record warm spring, second warmest summer, fourth warmest winter and a warmer-than-average autumn. The average temperature for 2012 was 55.3°F, 3.2°F above the 20th century average, and 1.0°F above 1998, the previous warmest year. The average precipitation total for the contiguous U.S. for 2012 was 26.57 inches, 2.57 inches below average, making it the 15th driest year on record for the nation. At its peak in July, the drought of 2012 engulfed 61 percent of the nation with the Mountain West, Great Plains, and Midwest experiencing the most intense drought conditions. The dry conditions proved ideal for wildfires in the West, charring 9.2 million acres — the third highest on record. The U.S. Climate Extremes Index indicated that 2012 was the second most extreme year on record for the nation. The index, which evaluates extremes in temperature and precipitation, as well as landfalling tropical cyclones, was nearly twice the average value and second only to 1998. To date, 2012 has seen 11 disasters that have reached the $1 billion threshold in losses, to include Sandy, Isaac, and tornado outbreaks experienced in the Great Plains, Texas and Southeast/Ohio Valley. Every state in the contiguous U.S. had an above-average annual temperature for 2012. Nineteen states had a record warm year and an additional 26 states had one of their 10 warmest. - On the national scale, 2012 started off much warmer than average with the fourth warmest winter (December 2011-February 2012) on record. Winter warmth limited snow with many locations experiencing near-record low snowfall totals. The winter snow cover for the contiguous U.S. was the third smallest on record and snowpack totals across the Central and Southern Rockies were less than half of normal. - Spring started off exceptionally warm with the warmest March on record, followed by the fourth warmest April and second warmest May. The season’s temperature was 5.2°F above average, making it easily the warmest spring on record, surpassing the previous record by 2.0°F. The warm spring resulted in an early start to the 2012 growing season in many places, which increased the loss of water from the soil earlier than what is typical. In combination with the lack of winter snow and residual dryness from 2011, the record warm spring laid the foundation for the widespread drought conditions in large areas of the U.S. during 2012. - The above-average temperatures of spring continued into summer. The national-scale heat peaked in July with an average temperature of 76.9°F, 3.6°F above average, making it the hottest month ever observed for the contiguous United States. The eighth warmest June, record hottest July, and a warmer-than-average August resulted in a summer average temperature of 73.8°F, the second hottest summer on record by only hundredths of a degree. An estimated 99.1 million people experienced 10 or more days of summer temperatures greater than 100°F, nearly one-third of the nation’s population. - Autumn and December temperatures were warmer than average, but not of the same magnitude as the three previous seasons. Autumn warmth in the western U.S. offset cooler temperatures in the eastern half of the country. Although the last four months of 2012 did not bring the same unusual warmth as the first 8 months of the year, the September through December temperatures were warm enough for 2012 to remain the record warmest year by a wide margin. - The nationally-averaged precipitation total of 26.57 inches was 2.57 inches below average and the 15th driest year on record for the lower 48. This was also the driest year for the nation since 1988 when 25.25 inches of precipitation was observed. - Winter brought below-average precipitation to both coasts and above-average precipitation to the Southern Plains, slightly lessening drought conditions that plagued the region in 2011. The winter precipitation total was 89 percent of normal. - Spring precipitation was 95 percent of the 20th century average with below-average precipitation in the Rockies and Midwest and above-average precipitation in the Northwest and Upper Midwest. - Summer precipitation was 88 percent of normal with dry conditions in the central United States. The West Coast, Gulf Coast, and Northeast were wetter than average. - Autumn was drier than average for most of the central U.S., with wet conditions in the Northwest, Ohio Valley, and Northeast. The autumn precipitation total was 85 percent of average. - Alaska was cooler and slightly wetter than average during 2012. The year began very cold for the state with a January temperature 14.0°F below the 1971-2000 average. Each subsequent season was also cooler than average, resulting in an annual temperature 2.3°F below average. Much of 2012 was also wetter than average, and the annual precipitation total was 9.2 percent above average. - Drought conditions continued to plague Hawaii during 2012. At the beginning of 2012, 47.4 percent of the state was experiencing moderate-to-exceptional drought, according to the U.S. Drought Monitor. By the end of the year, the percent area experiencing moderate-to-exceptional drought expanded to 63.3 percent of the state. - Tropical cyclone activity across the North Atlantic in 2012 as above-average with 19 named storms, ten hurricanes, and one major hurricane (Category 3 or stronger). This is the third consecutive North Atlantic tropical cyclone season with 19 named storms and ties with as the third most active season for the basin. Isaac and Sandy made landfall along the U.S. coast during 2012 causing significant impacts. Isaac brought large storm surge and torrential rains to the Gulf Coast. Sandy caused significant damage to the Northeast, with 8 million homes losing power and 131 fatalities reported. - The widespread drought conditions of 2012 peaked in July with approximately 61 percent of the country experiencing drought conditions. The footprint of drought during 2012 roughly equaled the drought of the 1950s which peaked at approximately 60 percent. The size of the current drought and the drought of the 1950s are smaller than the drought episodes of the 1930s. The current drought has yet to reach the intensity or duration of the 1950s and 1930s national-scale droughts. - Wildfire activity during 2012 was above-average with 9.2 million acres burned the third most in the 13-year record. Numerous large and destructive wildfires impacted the western U.S. throughout the year. The Waldo Canyon fire near Colorado Springs, Colorado destroyed nearly 350 homes and was the most destructive fire on record for the state. The Whitewater-Baldy Complex fire charred nearly 300,000 acres and was the largest on record for New Mexico. *Saturday, January 19, 2013, 10:00 a.m. to 2:00 p.m.
Meet in the Nevada Avenue parking lot at High Rock. We will walk a Blue and Yellow Trail loop removing invasive trees and vines. If you don’t have your own, Protectors will supply gloves and pruners (and refreshments). After a two hour work session (our 197th monthly workshop), we will take a short walk over nearby trails. For more information call Don Reckless at 718-768-9036 or Chuck Perry at 718-667-1393. Sunday, January 20, 2013, 3:30 p.m. to 5:00 p.m.
Come enjoy the park right before dusk and observe how nature settles in for the night. See how patterns emerge against the evening sky. Let the sky soothe you with its purple hues. We’ll walk along the lake with stops for reflection. Meet at the Victory Blvd. entrance to Willowbrook Park at 3:30 p.m. sharp. Dress warmly. If it’s raining or snowing at the time of the walk, the event is postponed to Sunday, January 27, same time. Greetings. 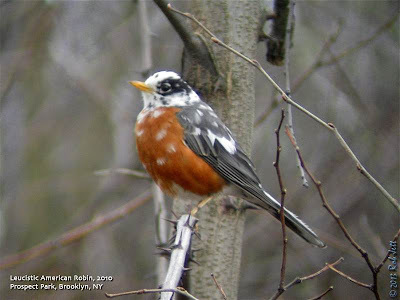 This is the New York Rare Bird Alert for Friday, January 11th 2013 at 8pm. The highlights of today's tape are WESTERN GREBE, BARROW'S GOLDENEYE, BARNACLE GOOSE, GREATER WHITE-FRONTED GOOSE, HARLEQUIN DUCK, BLACK-HEADED GULL, SNOWY OWL, GLAUCOUS GULL, EURASIAN WIGEON, Eurasian form of GREEN-WINGED TEAL plus more. On Wednesday a WESTERN GREBE was spotted on the ocean off the town of Montauk. The grebe was initially off the western edge of town off Kirk Park which has a parking lot just west of the IGA store. The bird drifted east during the day and has not been relocated since. If at Kirk Park check the pines for both crossbills and COMMON REDPOLL which have visited there recently. 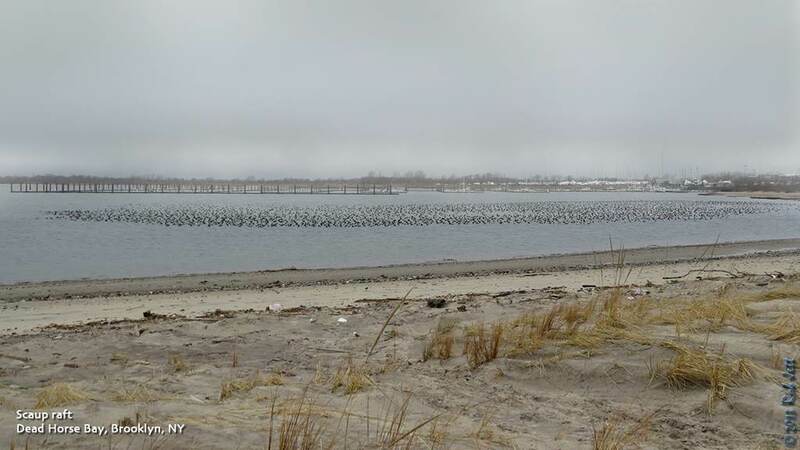 Other highlights in the Montauk area include a pair of BARROW'S GOLDENEYES which have been staying in a Common Goldeneye flock around the south end of Lake Montauk and an immature BLACK-HEADED GULL often feeding with Bonaparte's Gulls in the same area. This area can be viewed from South Lake Drive off Route 27. An adult BLACK-HEADED GULL was spotted off the Montauk Point Park restaurant last Saturday and 2 HARLEQUIN DUCKS were seen Wednesday from the restaurant and also off the Camp Hero Overlook. A few RAZORBILLS continue around the point and 2 ICELAND GULLS continue along the beach just west of the Montauk Harbor entrance with a LESSER BLACK-BACKED GULL also around Fort Pond or Fort Pond Bay. A CACKLING GOOSE continues at Deep Hollow Ranch. At Napeague the SNOWY OWL, missing last weekend, reappeared Monday on Hick's Island as viewed from the end of Lazy Point Road. An adult LESSER BLACK-BACKED GULL also remains there and a YELLOW-BREASTED CHAT was found Saturday near the end of Napeague Harbor Road. Six GREATER WHITE-FRONTED GEESE have been on or near Hook Pond in East Hampton recently and a GLAUCOUS GULL was present on the pond Monday and Thursday. A couple of CLAY-COLORED SPARROWS are among the birds residing at the EECO farm in East Hampton recently. Several AMERICAN BITTERN and a couple of GREAT EGRETS remain along Dune Road west of Shinnecock Inlet. Closer to the city 2 BARNACLE GEESE continue, the first at Van Cortlandt Park in The Bronx has been seen on the Parade Ground or surrounding golf course fairways as well as on the lake. The Canada flocks there also contain at least 1 CACKLING GOOSE and 15 RUSTY BLACKBIRDS were around the swamp Sunday evening. The other BARNACLE GOOSE usually roosts overnight at Belmont Lake State Park and during the day can sometimes be found at St. Charles Cemetery just west of Wellwood Avenue this area west of Belmont Lake State Park. Two GREATER WHITE-FRONTED GEESE and 2 CACKLING GEESE were also on the lake Thursday morning and can sometimes be seen in the wandering Canada flocks. A Eurasian form of GREEN-WINGED TEAL continues to be seen on Smith Pond south of Hempstead Lake State Park in Rockville Centre. Both Central and Prospect Parks have been producing one or more WHITE-WINGED CROSSBILLS and COMMON REDPOLLS this week and a YELLOW-BREASTED CHAT has been around Lookout Hill in Prospect to today with a second Chat hanging around the south garden at Jamaica Bay Wildlife Refuge. An ICELAND GULL was on Gravesend Bay in Brooklyn on Saturday. Out in the Jones Beach area 2 dozen COMMON REDPOLLS were around the West End 2 parking lot on Saturday with a LESSER BLACK-BACKED GULL there Sunday and a nicely marked adult ICELAND GULL has also been seen sitting in the lot occasionally. Also at Jones were a LAPLAND LONGSPUR to Wednesday when a couple of RAZORBILLS were spotted in the inlet. COMMON EIDERS remain at Point Lookout and a ROUGH-LEGGED HAWK has been along the Meadowbrook Parkway. At least one EURASIAN WIGEON plus the Wigeon hybrid continue at Massapequa Preserve usually now above the Pittsburgh Avenue pond. At Heckscher State Park the crossbills now seem to be mostly WHITE-WINGEDS with about 20 and a COMMON REDPOLL there on Tuesday with a CLAY-COLORED SPARROW there the day before. Two ICELAND GULLS were at Blydenburgh County Park in Smithtown Thursday and another was at Iron Pier Beach in Northville on Wednesday. A drake HARLEQUIN DUCK appeared on Long Island Sound off Setauket last Sunday and a lingering drake EURASIAN WIGEON was in Setauket Harbor. A ROUGH-LEGGED HAWK was around the now badly abused Calverton Airport grasslands on Tuesday and odd was an immature LAUGHING GULL on Eastport Pond last Sunday. For the next three weeks the tape will be handled by Tony Lauro so please call Tony with your reports at (631) 734-4126. While it may be a few months before they lay any eggs, our local Red-tailed Hawks have already begun their annual bonding rituals. Pairs can be heard calling each other and engaging in mock-battles in the sky above their territories. Many of the young birds from last year's broods, like this one in the Bronx, will soon be "encouraged" by their parents to leave the territory and seek out their own home base and mates. "Nelly" and "Max's" nest at Nelly's Lawn in Prospect Park miraculously survived the hurricane and the pair were seen checking out the nest tree this week. Also, I recently discovered a new nest site in Brooklyn's Holy Cross Cemetery. Wind-turbine installations are poised to exceed natural gas-fueled power plants in the U.S. for the first time this year as developers race to complete projects before a renewable energy tax credit expires. New wind capacity reached 6,519 megawatts by Nov. 30, beating the 6,335 megawatts of gas additions and more than double those of coal, according to data from Ventyx Inc., which is owned by the Swiss power transmission equipment maker ABB Ltd. (ABBN). The company plans to release final tallies in January. Congress has yet to renew the production tax credit, which provides incentives for wind farms completed before Dec. 31. Efforts to take advantage of the subsidy trumped interest in gas-fired stations, which are supported by a plunge in prices for the commodity resulting from added production through hydraulic fracturing. A surge of wind-farm connections in November and December may double the amount of wind capacity added this year to as much as 12 gigawatts, outpacing the additional gas turbines, according to New Energy Finance. To qualify for the tax credit, which pays wind farm owners 2.2 cents per kilowatt-hour of power they produce over 10 years, projects must be online and producing power by Jan. 1. Unless Congress extends the incentive, wind turbine installations may fall 88 percent next year to as low as 1.5 gigawatts, New Energy Finance forecasts. A bill to extend the wind production tax credit was approved by the Senate Finance Committee in August and promoted by Senator Chuck Grassley, an Iowa Republican who sponsored the first wind energy tax credit in 1992. In an effort to head off opposition to an extension, the American Wind Energy Association this month proposed a six-year phase-out of the credit, ending the subsidy at the start of 2019. The Washington-based industry group says 37,000 jobs will be lost if the credit lapses now. Some utilities oppose the plan, noting that the strength of installations shows wind can survive without subsidy, according to Joseph Dominguez, a senior vice president of Exelon Corp. (EXC), the largest owner of U.S. nuclear power plants. “The wind energy industry has matured and is thriving today; the PTC is no longer needed,” Dominguez said in a Dec. 13 statement criticizing the group’s proposal. “Rather than a reasonable phase-out, AWEA is essentially asking for a six-year extension of the now 20-year-old” tax credit. An increase in gas prices may make wind more competitive. Gas futures have risen almost 15 percent this year, which would be their first annual increase since 2007. Utilities in 29 states are required to get an increasing amount of their supplies from renewable resources such as wind and solar, whether or not Congress renews the tax credits. General Electric Co. (GE), the largest supplier of wind turbines to the U.S., has benefited from the surge in orders, said Chief Executive Officer Jeffrey Immelt. Registrar: Janet Schumacher email (preferred) janets33 [AT] optonline.net or cell: 718-594-7480. Guide: Gabriel Willow With Wave Hill Meet at the Perkins Visitor Center. The Hudson River valley hosts an impressive diversity of bird species, even during the winter months. Come explore the beautiful gardens and woodlands of Wave Hill and observe the hardy birds that spend the winter in this urban oasis. Advanced registration is recommended, online at www.wavehill.org, by calling 718-549-3200 x305, or at the Perkins Visitor Center. (Walks run rain or shine; in case of severe weather call the number above at x245 for updates.) Ages 10 and up welcome with an adult. NYC Audubon members enjoy two-for-one admission. Take an evening nature walk with naturalist Mike Feller in Fort Tryon Park. Bring the whole family for an exciting exploration of this 67 acre historic treasure. Explore Wave Hill’s tranquil gardens and woodlands with naturalist Gabriel Willow to observe birds in their winter habitats. Greetings. 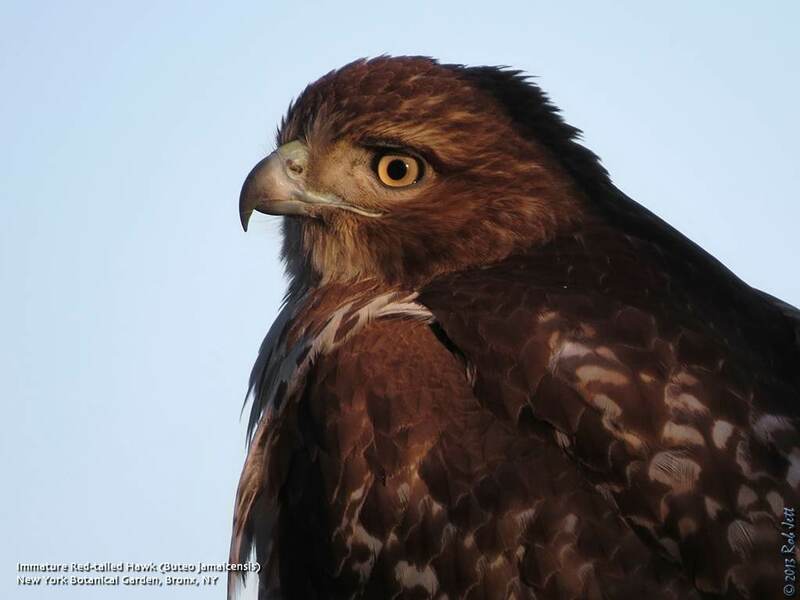 This is the New York Rare Bird Alert for Friday, January 4th, at 7:00pm. The highlights of today's tape are BARROW'S GOLDENEYE, TUFTED DUCK, BARNACLE GOOSE, GREATER WHITE-FRONTED GOOSE, Eurasian form of GREEN-WINGED TEAL, SNOWY OWL, BLACK-HEADED GULL, CLAY-COLORED SPARROW, and Winter Finches. The Southern Nassau Christmas Count on Saturday recorded 129 species. Highlights included the two drake EURASIAN WIGEONS on the ponds at Massapequa Preserve, a Eurasian GREEN-WINGED TEAL at Smith Pond in Hempstead, 18 COMMON EIDER and count period HARLEQUIN DUCK, 1 SNOWY EGRET, 14 GREAT EGRETS, and a YELLOW-CROWNED NIGHT-HERON, 4 NORTHERN GOSHAWKS, ROUGH-LEGGED HAWK and BALD EAGLE, 9 SEMIPALMATED PLOVERS, RED KNOT, count period LESSER BLACK-BACKED GULL and ICELAND GULL, 2 RAZORBILLS and 2 BARN OWLS, 19 TREE SWALLOWS, COMMON YELLOWTHROAT, LAPLAND LONGSPUR, 27 RED CROSSBILLS, 20 WHITE-WINGED CROSSBILLS, 13 COMMON REDPOLLS, and 1 PINE SISKIN, 199 BOAT-TAILED GRACKLES, 9 "Ipswich" SAVANNAH SPARROWS, and 1 CHIPPING SPARROW. The Putnam Count last weekend netted 78 species, including 5 SNOW GEESE, 9 BALD EAGLES and 2 PEREGRINE FALCONS, 6 AMERICAN PIPITS, COMMON REDPOLL, and 5 PINE SISKINS. The drake TUFTED DUCK was still being seen around the south end of Huntington Harbor through Thursday. Look for the duck especially around the marinas at the southeastern portion of the harbor around Halesite, the Town Park there offering a good vantage point. The duck does like to feed among the docked boats, so look carefully. The Bronx BARNACLE GOOSE continues to visit the Parade Ground with Canada Geese at Van Cortlandt Park. If not there, try the lake by the golf course. Tuesday the Parade Ground also produced a LAPLAND LONGSPUR with 21 Horned Larks. Staying with waterfowl, out in Montauk two drake BARROW'S GOLDENEYE were found Wednesday at the south end of Lake Montauk as viewed from South Lake Drive on the north side of Route 27. Also seen there was the elusive immature BLACK-HEADED GULL feeding with Bonaparte's. Two ICELAND GULLS remain around the Montauk Harbor Inlet, RAZORBILLS continue off Montauk Point, and some RED and WHITE-WINGED CROSSBILLS continue at a few different Montauk locations. A drake EURASIAN WIGEON was still at the Deep Hollow Ranch and Teddy Roosevelt County Park area last weekend, and a CACKLING GOOSE also remains there. At Napeague, the SNOWY OWL continues at times to be visible as it perches on Hicks Island across from the end of Lazy Point Road, and the adult LESSER BLACK-BACKED GULL was also still there. Six GREATER WHITE-FRONTED GEESE were around Further Lane and Hook Pond in East Hampton last weekend, with CACKLING GOOSE also on Hook. Birds at the EECO Farm in East Hampton recently have featured two CLAY-COLORED SPARROWS and one LINCOLN'S SPARROW. Hulse Landing Road in Wading River also has hosted CLAY-COLORED SPARROW, VESPER SPARROW, and WHITE-CROWNED SPARROW, plus COMMON REDPOLL. The BARNACLE GOOSE, plus a GREATER WHITE-FRONTED GOOSE often in the same vicinity, continue to be seen at Belmont Lake State Park or around the grassy habitats around St. Charles Cemetery off Wellwood Avenue, east of Farmingdale. The BARNACLE has been using nearby Colonial Springs Golf Course, but birders are generally not welcome at this private club. Birds at Heckscher State Park recently have featured a flock of WHITE-WINGED and RED CROSSBILLS often east of Field 8, a LAPLAND LONGSPUR with a few Horned Larks on the field at Field 6, and a few COMMON REDPOLLS, the latter showing up at many areas now, though in low numbers. Out at Jones Beach, some crossbills, mostly RED CROSSBILLS, remain at West End. The Christmas Count NORTHERN GOSHAWK was seen again last Sunday, and a ROUGH-LEGGED HAWK has been hanging around Tobay. A LAPLAND LONGSPUR was at West End on Sunday, and AMERICAN PIPITS have been rather common out there recently. 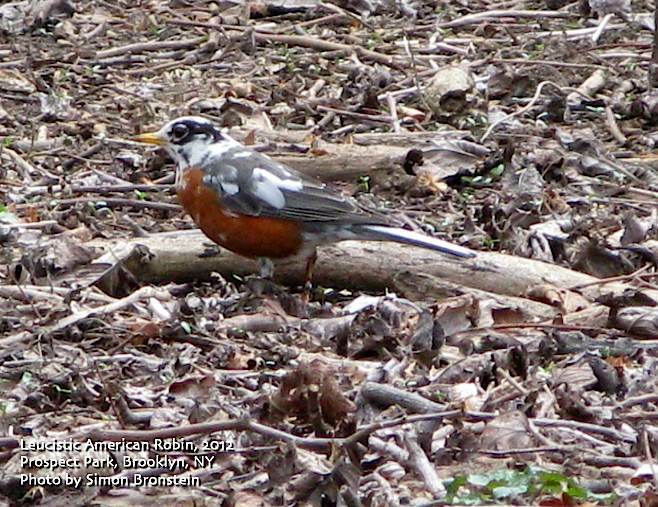 In the City, a NORTHERN WATERTHRUSH was still at Alley Pond Park Sunday, a YELLOW-BREASTED CHAT has been at Prospect Park recently, LESSER BLACK-BACKED and ICELAND GULLS were noted at Randall's Island Sunday, and a BALD EAGLE was at the East Pond of Jamaica Bay Wildlife Refuge yesterday. 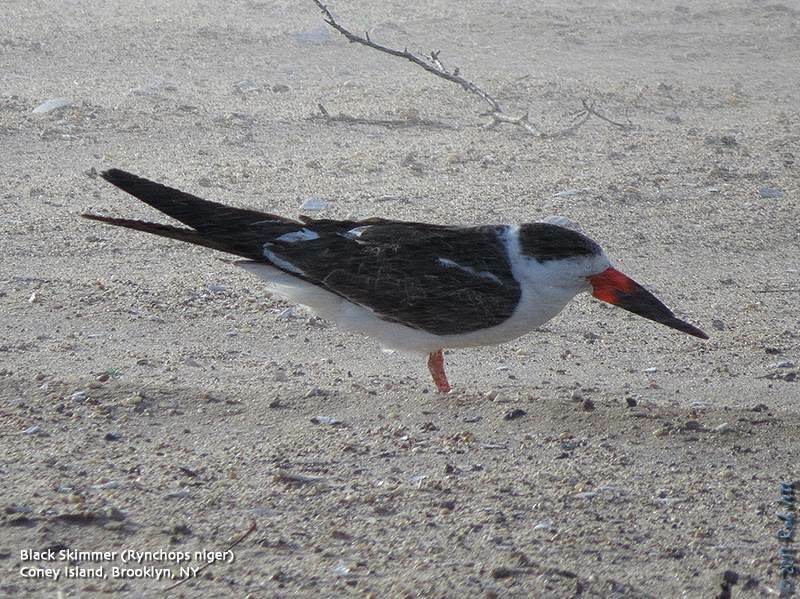 A few BLACK SKIMMERS have also been hanging around the Brooklyn waterfront. A CLAY-COLORED SPARROW continues at Marshlands Conservancy in Rye, but the ORANGE-CROWNED WARBLER has not been seen since Monday. December is not usually a month were many new species are added to one's year list. Over the past 4 years I've averaged just 5 "year birds" during the last month of the year. I guess I shouldn't have been surprised that December 2012 added only four birds. 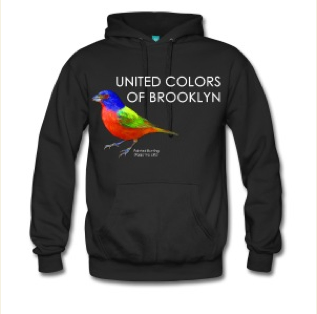 The surprise was that one was a "life bird" that is rarely ever seen in the borough of Kings. One of my last postings for 2012 was about alcids appearing along the coast and spotting a Dovekie at Coney Island. Up to that point, the Dovekie had been one of my jinx birds. That is to say, I'd unsuccessfully chased after sightings of this tiny, black and white seabird for years. It felt great to finally see one ... and in Brooklyn! Another nice find before the year ended was Common Redpoll. This is one of the "Winter Finches" that was predicted would be heading South in search of food. Like the crossbills, siskins and grosbeaks, their food supplies were affected by severe droughts in the north country. Finally, a bird that I rarely overlook each year, managed to escape my bins (and ears) until the last minute. American Pipits are common during the Fall migration, especially in mid to late-November. While walking down the beach at Coney Island with my birding buddy, Heydi, we flushed a single bird. Ironically, since that day I've spotted flocks of them three more times.